TFcon is happy to welcome Transformers voice actor Bud Davis to TFcon Chicago 2018 for his first ever convention appearance. The voices of Dirge, Metroplex and Predaking in the Transformers Generation 1 cartoon. Mr. Davis will be taking part in Q&A panels and autograph sessions with the attendees of the world’s largest fan-run Transformers convention all weekend long. Bud Davis is presented by Ages Three and Up. TFcon – America’s largest fan-run Transformers convention returns to the Chicago, IL area the weekend of October 26th to October 28th, 2018. TFcon USA will take place at the Crowne Plaza Chicago O’Hare Hotel & Conference Center in Rosemont, IL with special guest STEPEHEN KEENER (the voices of Fortress Maximus, Hardhead, Hun-Grrr. Mindwipe, Scattershot and Scorponok in the Transformers Generation 1) with more TBA. The TFcon Chicago 2018 hotel block is now available. You can book your room via the TFcon Chicago 2018 hotel reservation website. Registration for attendees will be available in the very near future. Sorry, didn't mean to pile on! Books looks great! 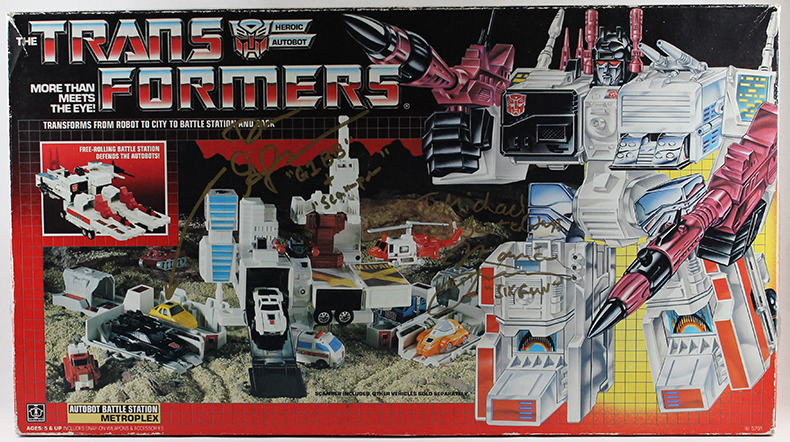 You didn't, the item has been packed away, i recently I took it out of storage and placed it in my autograph staging area for tfcon Chicago. Seeing it daily forced me to see if it could be fixed. This has been bothering me for about 3 years. After some testing with an old junk box, using lighter fluid I was able to lift the gold sharpie without damaging the box. I'm finally satisfied with it now. Did you have Dan Gilvezan sign the box where Hubcap is? I suppose PotP Predaking's release couldn't have come any sooner. That's what I getting signed by him, a G1 Predaking set is too expensive! dan signed for scamper the black car. he also thought hubcap was bumblebee, tried to get him to point to the black car but he saw little yellow and went for it. My metroplex box will finally be complete! I\'d like to know more about him because there seems to be little information on him and a lot of confusion on websites like IMDB. Like is he really a voice actor, Hollywood stuntman, and second unit director ? Is he really the same voice actor as B.J. Davis? With Predaking fever spreading, this is a nice opportunity!